‘Chiswick Without Borders’ is a celebration of Chiswick’s local community and its proud international character through embroidery and maps. 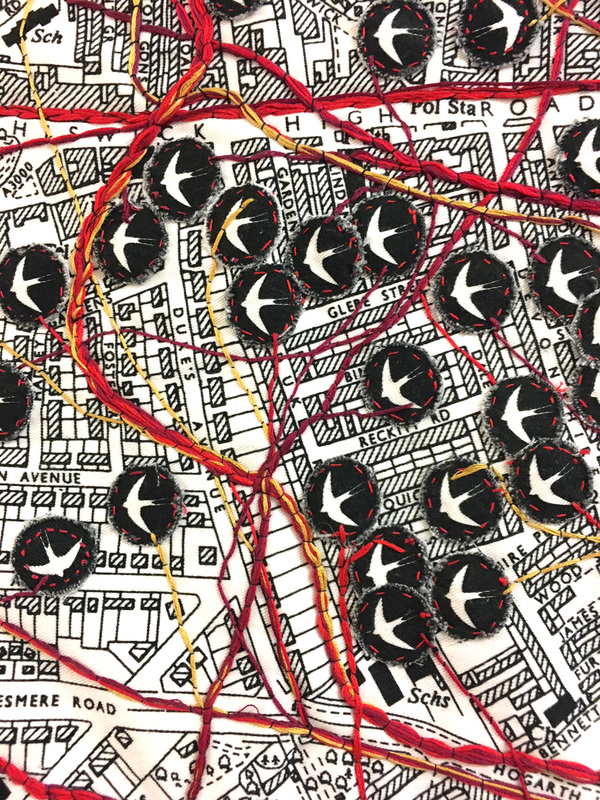 It is a participatory art project wherein Ekta invited people to stitch their connections to the world with a symbolic migratory bird- a swallow and its flight linking the map of Chiswick to places around the world. People were asked to pin one swallow to their street in Chiswick and another one to a location on the work map where their family roots are, linking both with a length of thread. Ekta was invited to conceive and lead this project by Abundance London. The project launched on 29 January 2018 coinciding with the unveiling of Chiswick Timeline mural. Hundreds of people engaged with the project and more than 600 birds were pinned on the day. A small team of volunteers, mostly local residents, assisted in embroidering the birds and threads linking to locations on to the map. The finished piece was showcased at London Auctions on 5th June 2018 and during Artists At Home 15-17 June 2018.